End in sight for traffic chaos? In the future technology will drive cars for us, eliminating road rage and accidents and making traffic jams a thing of the past. This is the view of BT's resident futurologist Ian Pearson, who is convinced that it will be technology rather than tolls that can solve the UK's current traffic crisis. 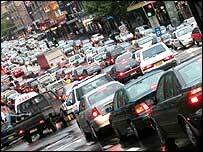 "The only real solution to traffic congestion may be to stop people from driving cars," he said. "I don't mean that we shouldn't have and use cars, just that they should be driven by computers and not humans, electronically tethered to cars in front and behind," he said. Mr Pearson envisages traffic systems that allow cars to drive centimetres apart at high speed, with cars joining flowing traffic much more easily thanks to computers' micro-second reaction time. "Using this technology we may not have the thrill of driving a powerful car on an empty road, but with the growth of traffic, that's an option that even today is open only to relatively few of us," he said. Already traffic navigation systems are allowing cars to bypass jams, although they work at the moment because only few people have them. As more and more motorists take advantage of such systems to beat the queues, they are likely to find new queues on the bypass route. Another solution, already being tested, is to have car engine management systems linked to local speed limits using on-board GPS receivers. "If the trials are successful, we may see all new cars fitted with the system by 2010, making it impossible to speed," said Mr Pearson. As we wait for sophisticated technology solutions to traffic chaos, existing broadband connections can also play a part in reducing traffic on the roads. Having a fast net service means more people are avoiding the roads altogether and choosing to work from home. The internet can also provide people with round-the-clock and up-to-date information on public transport as another alternative to gridlocked roads.